The intersection of El Camino Real, East Fremont, and Wolfe Rd is one of the most congested in Sunnyvale. Learn about the results of a city traffic study, and consider the impact on this intersection from the new Apple II campus, as well as three other potential big developments in Sunnyvale. Sunnyvale city planners are requiring an environmental impact report EIR for a large development project proposed by De Anza Properties for Butcher’s Corner located at the confluence of El Camino Real, East Fremont Avenue and South Wolfe Road. The applicant, De Anza Properties has submitted plans for Forty-one townhome units and 115 apartment units with surface and underground parking is proposed for the El Camino Real and Wolfe Road site. The proposed townhouse buildings are three stories, while the other two proposed buildings are seven stories. Sunnyvale City staff raised several design concerns, ranging from adequate parking to building setbacks. Staff also recommended the building height along El Camino and Wolfe should be reduced to about four stories. CLICK HERE for San Jose Mercury News coverage by Alia Wilson dated 9/10/2014. 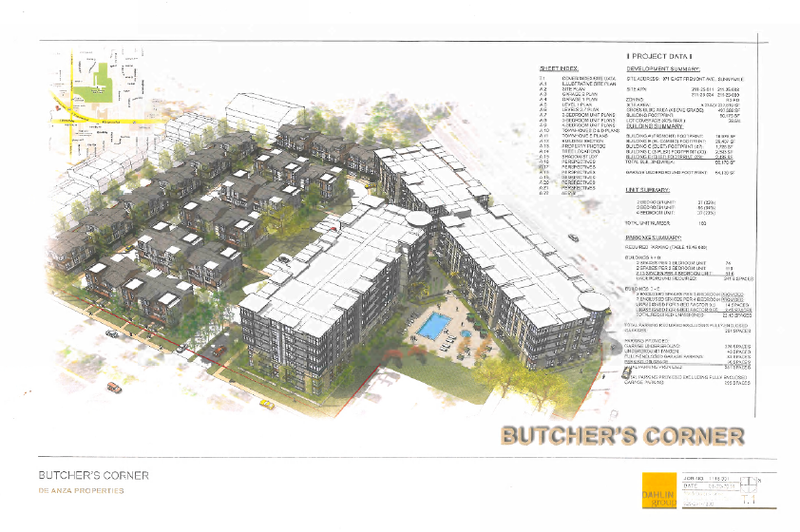 CLICK HERE for the Butcher’s Corner Architectural Plans submitted to the City of Sunnyvale, CA.